Geocaching is a pursuit which has gained a lot of popularity since it was first conceived in 2000. It was in that year the US government decided to make ordinary global position satellite (GPS) receivers accurate to a thirty foot radius. A techie who had been playing with commercial GPS receivers posted the location of a bucket he’d buried in the woods and challenged his internet friends to find it. As of today, Geocaching, as the pursuit was soon called, is a global phenomena with over a million registered “caches” covering the planet. The main company promoting this game is Groundspeak, but other conventions, such as Open Caching, are out there. I think this book is a first: a geocaching mystery novel. With the pursuit of geocaching barely 12 years old, I’m surprised it took so long. It’s a natural fit: hidden clues, mysterious people dropping secret objects in hard to find places. I keep waiting for the first big-budget geocaching movie to hit the screen, or at least Netflix. In the meantime, add this to your list of geocaching books to read. 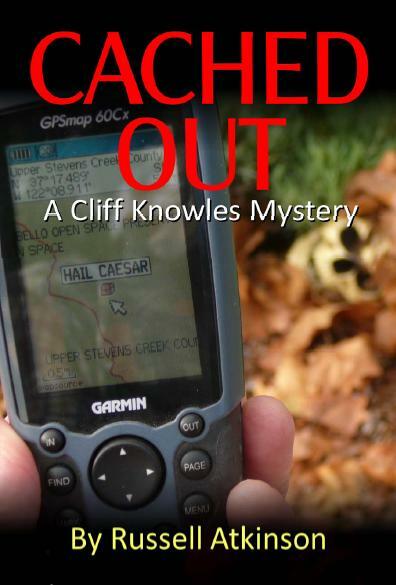 Cached Out is the latest in the “Cliff Knowles” series by Atkinson. The protagonist is a retired FBI agent who finds that he can’t leave his former profession. 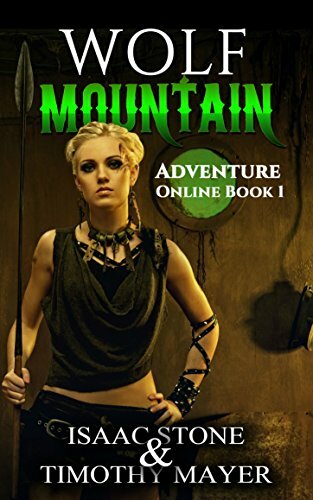 Right now there are two books in the series, the other being Held For Ransom. Russell Atkinson, the author, is also a retired FBI agent who enjoys geocaching. Like his protagonist, he lives in California. He’s also a member of the American Cryptogram Association. Truly an accomplished man. He also has a blog, Electricaching. The book begins with Cliff Knowles geocaching in a Southern California state park. He’s searching for a puzzle cache named “Hail Cesar” hidden by a mysterious cacher known as Enigmal. He finds the cache, but accidentally stumbles over a skeleton. Cliff, who caches under the name “CliffNotes”, finds a park ranger and leads him to the grim find. Soon it turns out the skeleton belongs to a wanted drug dealer named Hector Gutierrez. Curiously, Gutierrez escaped from a drug warehouse raid where Cliff was involved before his retirement. Next, he finds himself being interviewed by Deputy Mike Hsiao and Bureau of Narcotics Special Agent Karen Delgado. Sure the murder will be handled by the proper authorities, Cliff solves another puzzle cache. He finds it inside an over-turned car, which had crashed through a guard rail years ago. Shortly after logging his find, someone else finds a decomposed body in the car’s trunk: who just happened to be the former drunk driver of the car. The driver had killed both the girl he was with and a California Highway Patrol officer when he went out of control. Then another body turns up near a cache Cliff has found. Also with a vague connection to him. Cliff Knowles finds himself pulled out of retirement to clear his name and find the “Geocache Killer”. Because of his background, he’s considered a suspect. One thing I did learn from the book is how the Federal Bureau of Investigation is structured. The novel gives you an inside look at the terminology and daily activities of FBI agents. Pretty soon you become used to the acronyms for Special Agent In Charge and every other government agent heading. You learn the FBI has it’s sure of turf fights with other law enforcement agencies. None of this should come as a surprise, but hearing it from someone who has been there gives it a veneer of reality. There’s also an extremely graphic attack by a mountain lion. I don’t know how anyone survives an encounter with these beasts. I doubt Atkinson was writing from experience, but there are plenty of people who have survived and their testimony is out there. For a taste, think of the gruesome conclusion to the documentary Grizzly Man. I don’t want to give too much of the plot away, it is a mystery, but there is also a good scene involving a band of geocachers rescuing someone from a cliff. Anyone who’s been around geocachers will recognize every type imaginable. If I have any criticism of the book it’s the conclusion. Again, don’t want to give away too much, but I will say Cached Out has one of the most chilling endings of any mystery novel I have ever read. It left me uneasy; read it and you will understand. Whether that was the intention, only the author can say for sure. I highly recommend this book. You can find it on Atkinson’s own website or order it directly from Amazon.com. Do you now of any writer with same style as Russell Atkinson or books similar? No. I’m not that knowledgeable on police procedural novels. You might check out The Mystery Files in the sidebar.